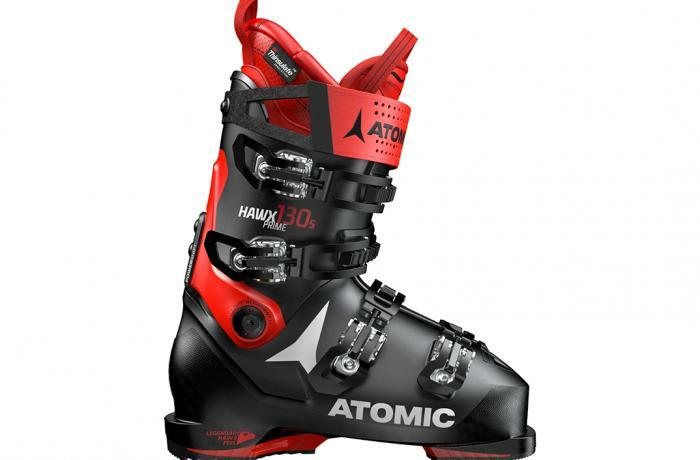 The 2018/2019 Atomic Hawx Prime 130 S was tested in the men's All-Mountain medium width category at Silver Mountain Resort by the experts at America's Best Bootfitters, powered by Masterfit. After several seasons as one of the best selling All-Mountain boots on the market, the all new Hawx Prime 130 S returns the same in name only—well, that and the fact that it still fits and skis at the top of its class. This is a completely re-made Prime, with thinner, stiffer polyurethane shell wall construction (a la Hawx Ultra) that shaves weight and improves the closeness of fit throughout, though it's still a comfy ride in the Hawx tradition, but now with a more precise fit, a more accurate steering linkage to the ski, and less heft underfoot. The new Hawx Prime fits the same as ever in the toebox and forefoot, according to our team who threw 3's and 4's at that area, but it tapers to a closer fit at the throat of the boot where the base of the lower leg, ankles and heel are held a bit more closely than in the past—testers gave those zones 3's and 2's. Anatomical wrapping would sum up the way the new Hawx Prime 130 S contours around the shape of the foot and leg. Testers liked the way the shell and liner worked to accommodate common bony spots like the ankles and also praised the way the slightly taller than average cuff flared progressively to suit the calf muscle. Thinner, stiffer plastics seem to get a little more stiff in the cold, and testers mentioned that taking the boots off was a bit more difficult than putting them on. The new design brings a new feel to the Hawx Prime experience—edging movements are now much more crisp and reactive than in the past, testers reported, and fine tuned steering movements are now rewarded with immediate ski reaction without any slop-induced lag. The creature comfort of the medium width Hawx remains, but comes with newfound performance gains. Testers liked the stance angles of the boot board ramp and cuff, and also liked the fact that dual cuff adjustment and forward lean adjustments are still on board. Testers liked the no-slip soles and the lightweight, wide but minimalist Velcro power strap with its simple pulley loop. Memory Fit shell molding is cool for auto-customization of the fit by cooking the shell in an oven, though few testers found the out-of-box fit problematic enough to consider it. The Power Shift feature (which accounts for the "S" in the model name) allows for adjustment of the forward lean and/or stiffness.